The filling has to cool down, so we’ll start making the cheese filling first. MELT butter in a medium-sized pan on medium heat and wait until the bubbles have disappeared. ADD 2 tablespoons of flour all at once and mix well using the wooden spoon and let it cook for a few minutes. Now you’ve created a roux, better known as a thickening agent. Switch to a whisk and gradually POUR the milk and cream into the pan while you mix well to prevent it from creating lumps. ADD the grated cheese and let it cook for a few minutes, you’ll notice the mixture will thicken. SEASON with pepper and salt and add the truffle paste and let it cool off completely. Now for the profiteroles, combine milk and butter in a second medium-sized pan and heat it up. Then ADD the flour all at once and use the same wooden spoon to combine it well. Let it cook for a few minutes on medium heat and stir a few times to prevent it from burning. It’s important the mixture is cooked enough, otherwise the profiteroles will stay flat during baking. Turn off the heat and let it cool off a few minuten. Then add the eggs one by one, keep on stirring and add the next egg when the other is completely absorbed. The mixture should be thick, smooth and shiny. ADD the truffle paste and let it cool off slightly before adding it to the piping-bag. PRE-HEAT the oven to 210 degrees celsius or 410 degrees fahrenheit. PIPE the choux pastry on the oven tray lined with parchment paper. You can create any size you like, we decided to make medium-sized profiteroles, keep in mind they will puff up and become larger during baking. 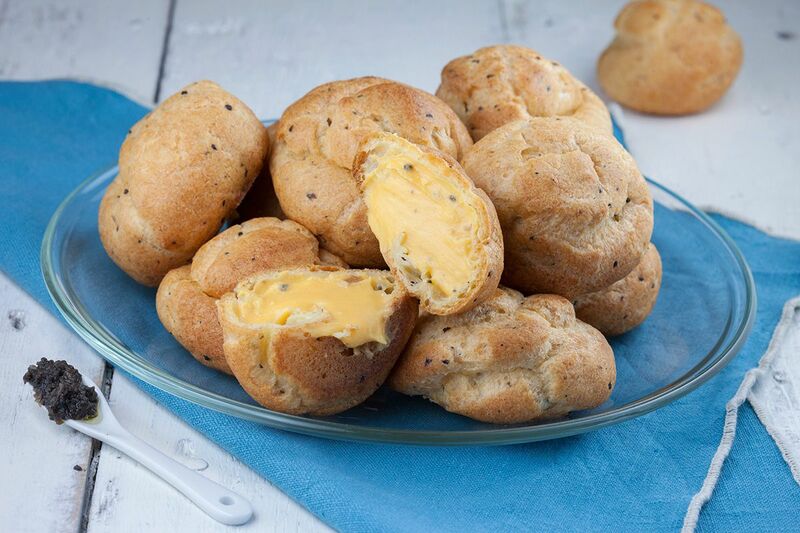 Dip your finger in some water and create a round top instead of a pointy profiteroles. BAKE in the oven for 10 minutes, or until golden brown depending on your oven. Don’t open the oven door too quickly, otherwise they will collapse. Once they’re done, let them cool off slightly. SCOOP the cheese filling into a piping-bag without nozzle. 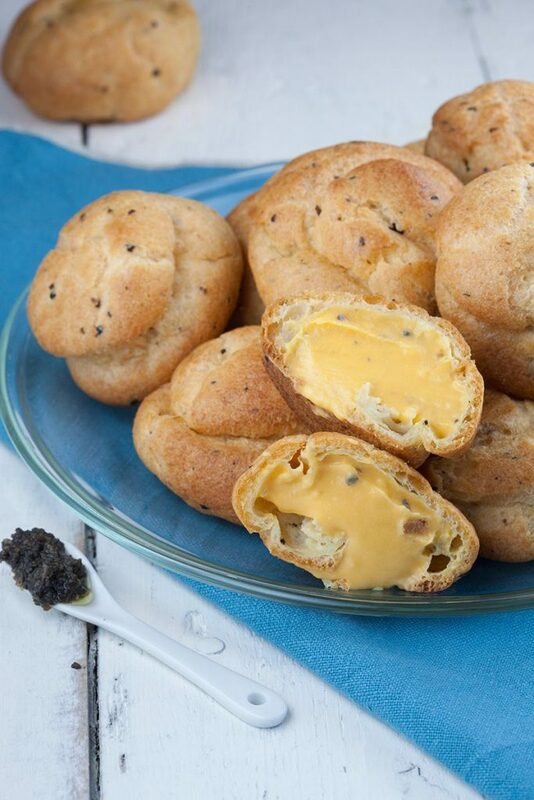 Use a paring knife to create a small hole in the bottom and fill them with the cheese filling. Enjoy! I love cream puffs and gougeres. 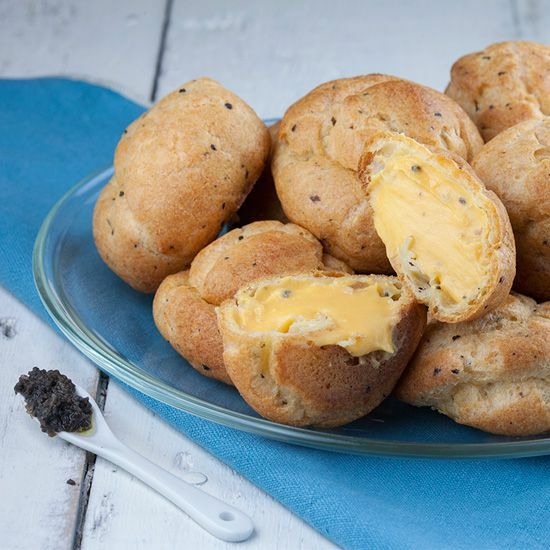 My favourite savoury puffs are made with blue cheese but these sound yummy too.